"After fifteen years... The adventure once again begins to revolve at full speed—"
November 20th, 2015. The Premium Bandai anime goods shopping site has added a page on on the upcoming D-3 Ver. 15th: Digimon Detect & Discover Digivice, a reissue of the 2000 toy similar to 2014's Digivice Ver. 15th. The exact list of Digimon included is currently unknown, but V-mon and Stingmon's complete lines have been confirmed by the poster. 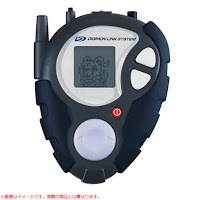 The slogan for the device is a reference to the lyrics of Digimon Adventure 02's Japanese opening theme, Target ~Akai Shougeki~, which opens "The story that has beguns to revolve at full speed dyes the earth red." Exactly what kind of gameplay the Ver. 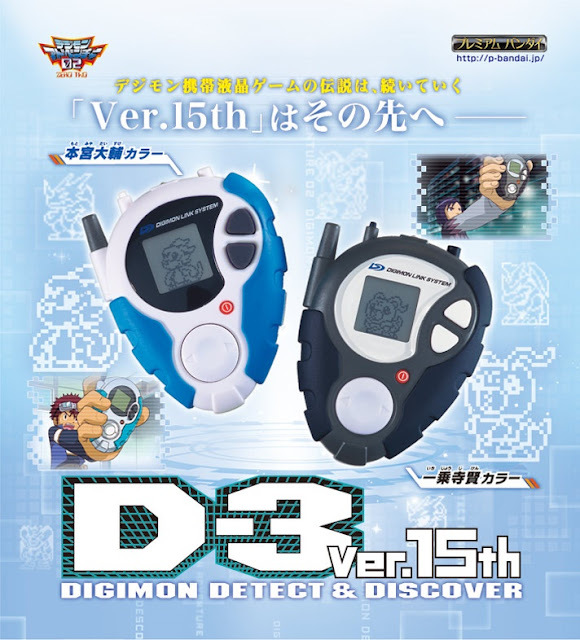 15th D-3 will have is unclear; the original device used radio wave detection to gather Digimentals, and used the Digimon Link System to connect with the D-Terminal toy and WonderSwan Digimon games to unlock higher stage evolutions. 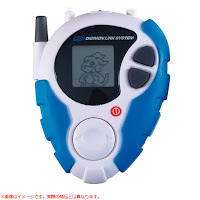 The new devices have the original DLS logo on them, but appear to have their WonderSwan ports removed. Preorders for the device will open on December 25th, at which time Bandai will also begin publishing more information about the D-3. Only the first six thousand orders for both models cumulatively will be taken. The device is priced at 9990 yen, approximately $82 at the current exchange rate. Fans not residing in Japan will have to go through a middleman service to purchase the device, as P-Bandai does not service countries other than Japan. Bear in mind that all three models of the Digivice Ver. 15th originally preordered for exactly the same price and currently go for between $160 and $270 on the secondary market, so tamers that are interested in the D-3 should place their orders as quickly as possible. The preorder start time is 11:00 PM Japanese Standard Time on December 25th, 2015, and the devices will ship out in June 2016. As with the previous Ver. 15th, this is likely the only Digimon electronic that will be launched in the coming year, barring another color version. It's recommended that fans support the device so that the other products P-Bandai surveyed the public about can be launched further down the line. The D-3 Ver. 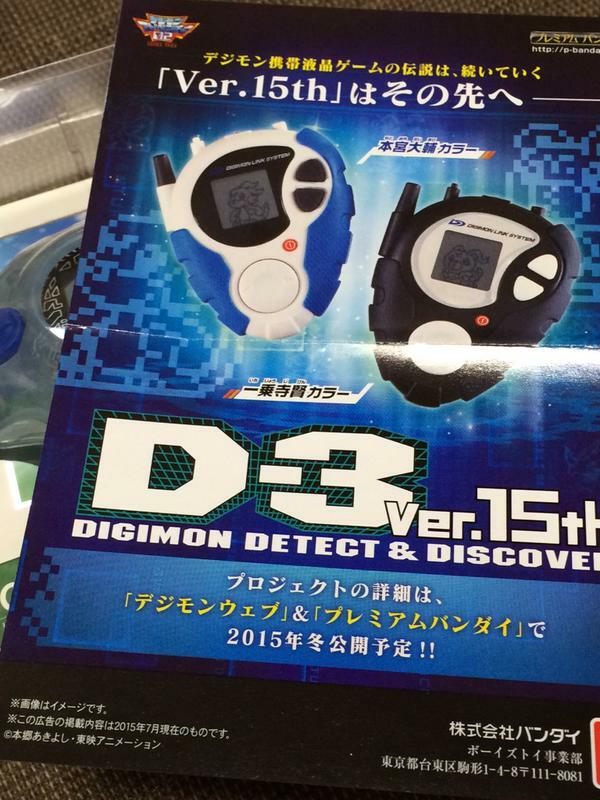 15th was originally leaked through a flier packaged with the Original Color Digivice Ver. 15th, a photo of which was uploaded by Japanese fan hisa [sic] to Twitter on July 25th, 2015. The D-3 will launch in classic Motomiya Daisuke and Ichijouji Ken colors. Any other color options remain unconfirmed, but the original D-3 from 2000 came in eight different color sets, including three that never appeared in the anime proper.